My dissertation examines literary representations of celibacy after the English Reformation; I look at how Catholicism’s institutional celibacy shaped anti-Catholic rhetoric at the same time that it created a space to articulate non-normative sexual and asexual desires. More broadly, I’m invested in recent developments in feminism, asexuality, and queer studies, especially gender and religion. I have presented some of my academic research in my published writing for the public. I also have ongoing research projects in the digital humanities, using data visualization to trace networks and examine trends in the production of texts. For inquiries about consulting on any of these subject, please contact me. I am a curator and contributor to the SDFB database visualizing relationships among early-modern people who lived in England. 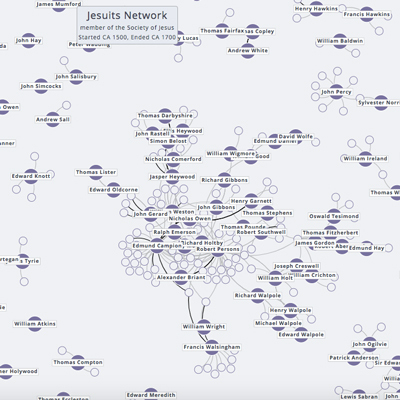 I am responsible for over two dozen additions of persons, relationships, and group assignments to the database, specializing in English Jesuit missionary networks. The first-level network of members of the Society of Jesus is pictured to the left. I am interested in trends in the distribution and popularity of representations of asexuality in fanfic in the fanfic database Archive of Our Own (AO3). 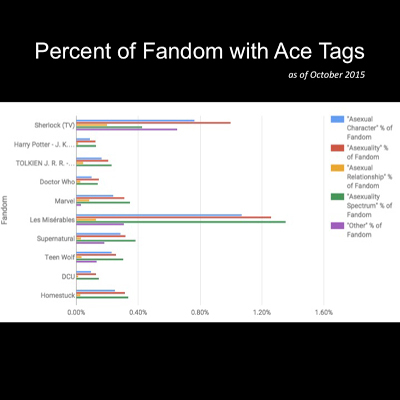 This is an ongoing project focusing on trends in the BBC Sherlock fandom, the fandom with the greatest gross number of fics featuring asexuality (and the second-greatest relative to non-ace fics in the fandom) in the archive.